84 (Coventry Airport) Squadron Air Training Corps: The Annual Squadron Bag Pack Results are in...! 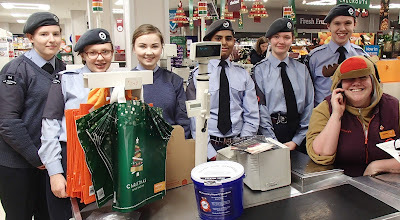 On Saturday 12th December a team of cadets and staff from 84 (Coventry Airport) Squadron took up their positions at the end of the checkouts at Sainsbury's in Kenilworth for the Annual BagPack Fundraiser. This year, despite being a week earlier than normal and only having the one day to collect, they managed to raise a staggering £960!! Cadet Mulholland, Sergeant Jenner and Sergeant Walton get ready to collect. The bag packing event is now a firm tradition in the Christmas calendar for the Squadron and each year there is great anticipation to see if the buckets will be filled with more donations than the previous year. 2015 has proved to be a bumper year with many donations adding to the grand total. Cadets were on hand at each available checkout from 0800 in the morning to 2200hrs to help customers with their shopping. Mostly this involved carefully packing food and items as they were scanned through the checkout but occasionally helping customers load their goods from the trolley onto the conveyor belts was also a key skill. This year, customers were much more savvy about their bags following the new 5p charge so cadets often had to juggle items into as few bags as possible! Sergeant Jenner packs for her Mum; Cadet Chauhan and Cadet Bennet on the go! Throughout the day, there was a fantastic atmosphere with cadets and staff engaging with the public and Sainsbury's staff helping everyone get into the festive spirit. There were many compliments from the public commenting on the smartness and professionalism of the cadets in their approach to their tasks. One elderly lady said "they are a god send today, I hate packing so this is a real treat for me!". Another customer praised the politeness of their helper saying "he was so chatty and polite and his uniform and shoes are just fantastic". Many of the customers stopped to tell their own stories of being in the Air Training Corps or in the Royal Air Force itself. They reminisced of the 'good-old days' and remarked on how excellent the organisations and been for them in their careers. The money raised from this event will really help the Squadron in putting on the many diverse activities offered to the cadets who attend twice-weekly meetings, 'parades', as well as going towards the ever increasing running costs such as insurance for the Squadron-owned minibus and other associated costs. The Air Cadets receives some funding from its parent service the Royal Air Force, but most of the money is received from cadet subscriptions and fundraising from events like this one. 2016 is already lining up to be a busy year with the 75th Anniversary of the Organisation as well as the 70th anniversary of 84 Squadron so there are plenty of events and activities in the pipeline to celebrate. If you would like to be part of this next chapter in our story then please get in contact to find out about how you can get involved either as a cadet or staff volunteer.